Comic Book scriptwriting begins with strong storytelling. Although the final storytelling in a comic is much more visual that text oriented, the first storytelling in the group has been verbal and theatrical in some of the improvisations. * a number of characters with names and trait sets. The group now focuses on storytelling ideas to produce a written script. or in the middle of chart paper or chalkboard. In the spaces, flag or number the parts of the story you can picture. Describe that picture in words for your illustration. * time of day your story takes place. * something funny you can include. Is there any research you need to help you illustrate? Revise character pages to see if you can draw each character from all angles. Character detail provides more possibilities for story action and conflict and illustration. Can you add or delete something to make the drawing easier? Clearer? 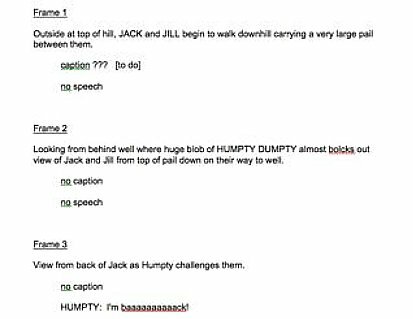 Write the dialogue for each character. Write the captions you will need. 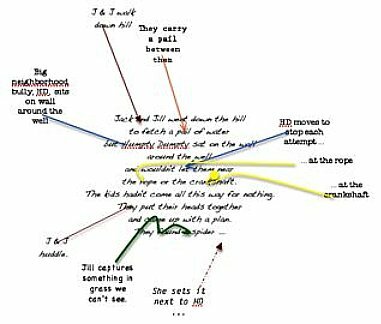 Complete the final script writing of your story frame by frame. Number each frame. Describe the story that is taking place. Describe what each illustration shows. What dialogue will you keep? What narration/caption will you need? Return from Comic Book Scriptwriting to Comic Books hub page for even more comic book teaching ideas! Return from Comic Book Scriptwriting to Real World Content Advantage home page.